United Way of Connecticut 2-1-1 stands ready to help 24 hours a day, 7 days a week, 365 days a year. On Monday, 2/11, celebrate National 2-1-1 Day by reminding your family, friends, neighbors and coworkers to dial 2-1-1 or visit 211ct.org for the information, education and connection to services they need. Are you in a housing crisis? Are you or someone you care about in need of mental health services? Are you looking for an opportunity to volunteer in your community? In Connecticut, 2-1-1 Contact Specialists are ready to help 24 hours a day, 7 days a week, 365 days a year. 2-1-1 is a free, confidential information and referral service that connects more than 94 percent of our nation to essential health and human services either online or over the phone. 2-1-1 Connecticut is one of more than 200 2-1-1's located throughout the country. Every day, highly-trained 2-1-1 Contact Specialists help callers access basic needs assistance, community resources and financial stability programs and resources such as free tax preparation assistance, job training and budget coaching. Contact Specialists also help callers in distress find relief when they are faced with food insecurity, homelessness, a mental health crisis or addiction. In 2018, 2-1-1 received more than 320,000 requests for service and more than 2 million web visits were made to 211ct.org. Have you created “My 2-1-1 Account”? My 2-1-1 Account enables community providers, case workers and individuals to create custom resource lists and care plans that can be saved, shared, implemented and updated as needed. 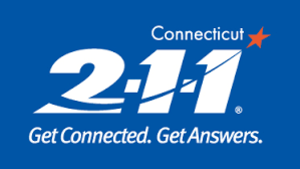 In addition to providing information and referrals to programs and services, the 2-1-1 Connecticut contact center is certified in crisis intervention and accredited by the American Association of Suicidiology. Last year, Contact Specialists handled more than 114,000 crisis calls from individuals faced with situational, behavioral and emotional crises. 2-1-1 is proud to be the first place Connecticut residents turn to access help and find resources in their communities. 2-1-1 Connecticut is operated by United Way of Connecticut and receives support from the State of Connecticut and Connecticut United Ways.